This entry was posted on July 22, 2010 at 2:01 pm and is filed under 1800s, Bluestone, England, Stonehenge. You can follow any responses to this entry through the RSS 2.0 feed. You can leave a response, or trackback from your own site. 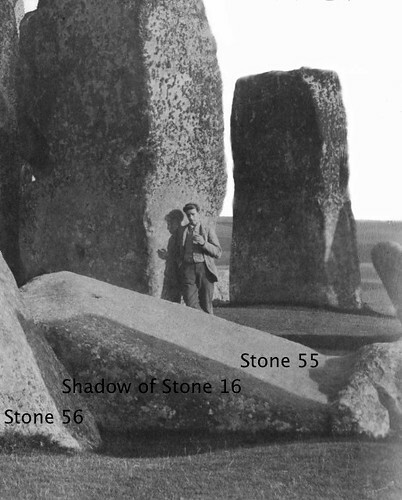 It’s a trick of the light – the shadow falling on the back of the leaning Stone 56 and the prone Stone 55 is cast by Stone 16 and it makes it look as if there’s an extra stone leaning against the back of 56 when there isn’t. Point taken, I will just refer to this picture as the un-numbered stone stack 🙂 The stone I am interested in is leaning and has a great amount of moss under it. Which stone with a great amount of moss underneath it are you referring to? I’m sure that the only two stones in the foreground are 55 and 56. I stand corrected, on closer inspection, I find you are correct! See my next Blog for my revised results.